Visit to the Big, Big City. Puerto Vallarta is a big city, which we decided to stay in the middle of. 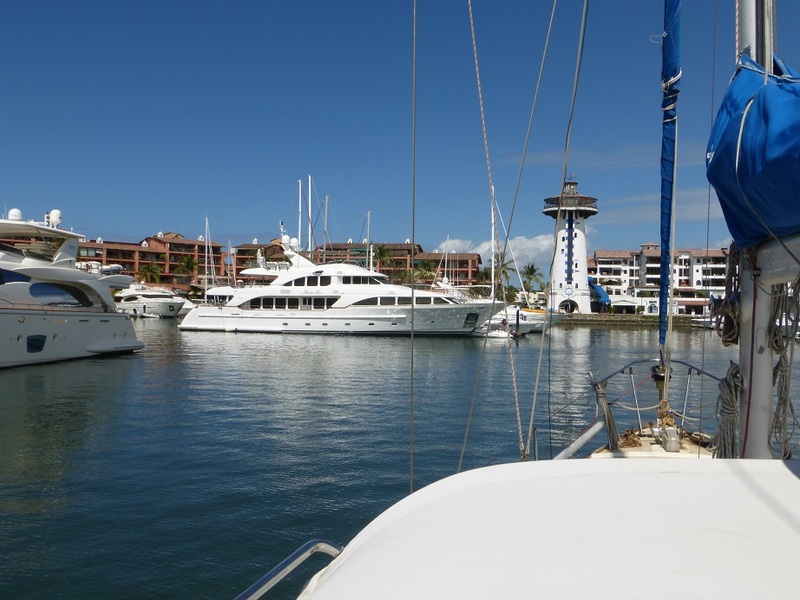 Marina Vallarta used to be the most amazing marina anywhere, but there was some corruption and deferred maintenance, and now we can afford it. It’s under new management, and being rebuilt, and actually very nice. We stayed two nights, went shopping at Wal-Mart and Costco (walk to, taxi back), and are now fully outfitted and provisioned. The way into the Marina is as narrow and as dramatic as it can be. These young men and women have apparently been working extremely hard at their studies and decided to use a little of their work-study earnings to take a well-timed vacation. Also, wooo! These were our neighbors. We were right behind the sport-fisher in the middle of the picture. 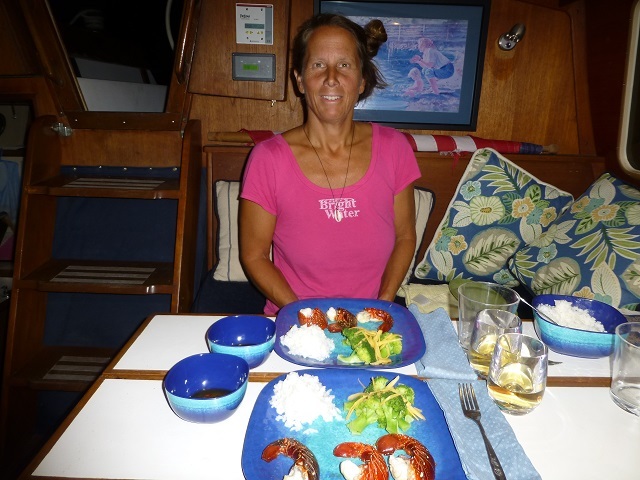 Great restaurants and people around the marina. 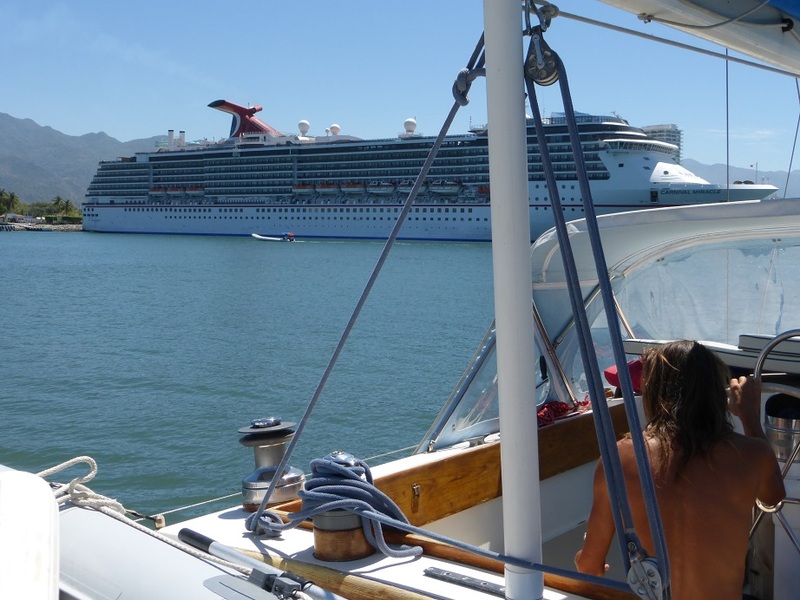 No cruise ships when we came in, two the middle day, one when we came out. Nice to see the town with different levels of cruise flooding. Loreto has a little tiny harbor. It was probably built for the cruise-ship trade, but it’s just a square breakwater on a long, long beach. It’s probably 300′ on a side, and lined on the inside with tourist-trip and professional-fishing pangas. 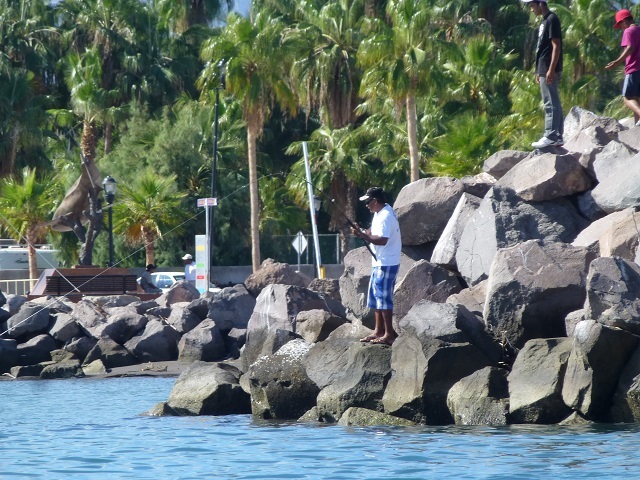 There are usually locals fishing off the breakwater, and usually they catch the tiny, poor-tasting fish people usually catch when they fish off breakwaters. He fished inside the breakwater with a series of bare hooks. When he snagged a mullet (or something), he reeled it in, changed his end tackle, stuck a great big hook through the back of his new live bait, and cast it out outside the breakwater. The pelicans and boobies immediately started dive-bombing his bait, but he reeled it back in quickly and got a hit fifteen feet off the breakwater. Thirty seconds or a minute later he had this monster on the beach. The whole process took maybe two minutes. So last week we were anchored out here on the south side of Isla Coronados waiting for the “Norther” to stop blowing 25-30. This is a normal “Winter in Baja” activity. Nancy and I went hiking up a wild arroyo (pictures soon). 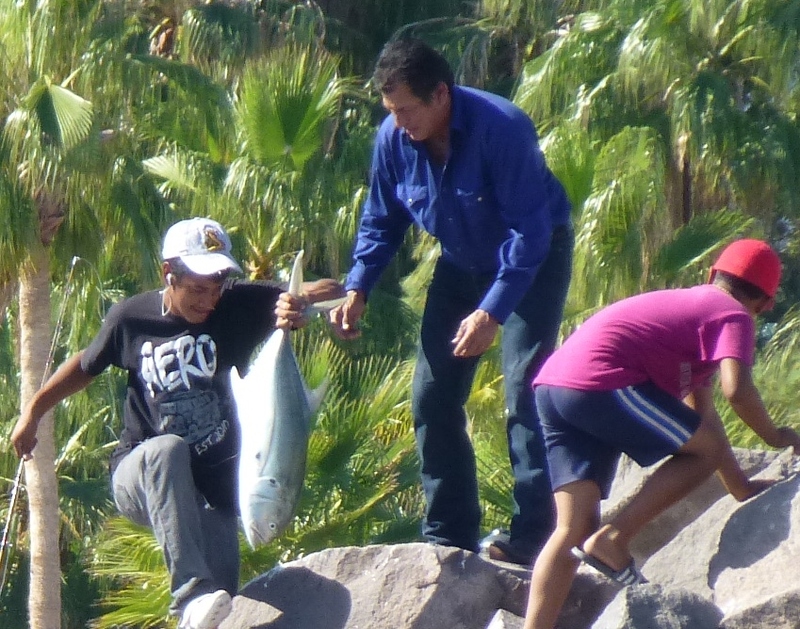 When we got back to the dingy we saw three fisherman walking their panga (a 24′ open boat) up the beach. The “beach,” in this case, was three miles of bowling-ball sized/shaped rocks. They had two more miles of beach, then ten miles of open water, to get back to Loreto. “No Bueno?” I asked, pointing at the motor. “No Gasolina,” the guy in the boat said, lifting up the poly water jug they use for a fuel tank. “Yo tengo dos gallons gasoline, pero no aciete,” I said. The interesting thing about that sentence is that aciete is the only legitimate Spanish word. It means oil, like in 2-stroke outboard oil. Well, they had some of that. So Nancy and I ran out to Bright Water in the dingy and came back with 2 1/2 gallons of gas. Before he took his container back, he handed Nancy a black plastic bag. She tried to decline but eventually took it. 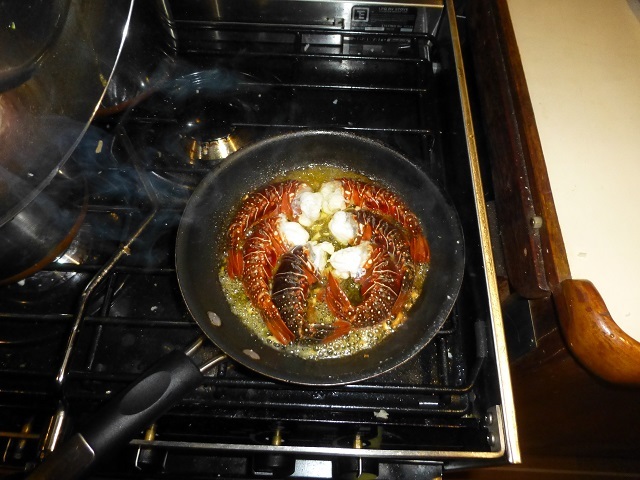 We didn’t open the bag until we got back to the boat, but were nicely surprised to find 18 langosta tails. Not huge, but still. Three per meal, so six very nice meals for a few bucks worth of gas. I hope it was enough to get them back to town. We’re living large, Bright Water style. That’s fresh broccoli with cheese on the side, and the last of the white wine. Tasty. Your life belongs to the Tribe. My good friend is a Samoan chief. The two of us, and several other friends, were discussing what manhood means in modern society. How the standard roles don’t really apply, how modern media mixes everything up, how we don’t give our sons a clear path anymore (and how we’ve had to find our own path). My friend returned to Samoa a few years ago and got the traditional tattoo. It’s a monster, normally taking several weeks. Even though he lives off-island, he takes his duties seriously, and I asked him why he got the tattoo. 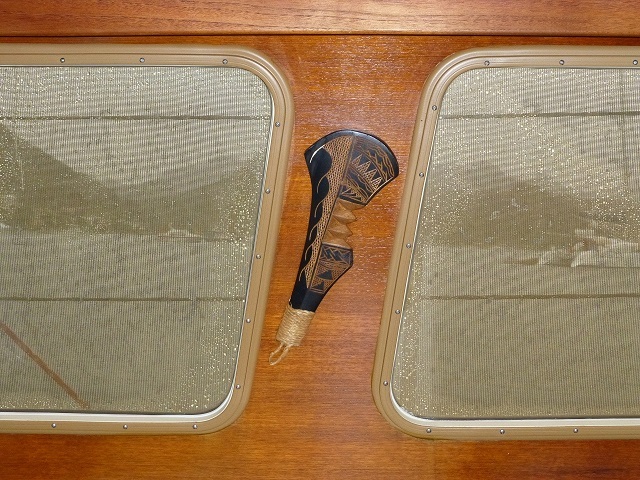 He and his wife gave us this Samoan war club (a Pouvai) as an early boat-warming gift. It reminds us of them and their friendship and their love, but it also reminds me to commit my life to my “tribe.” I see that as my job on this journey – what do I owe, and how can I repay that debt? It’s not an easy question to answer.